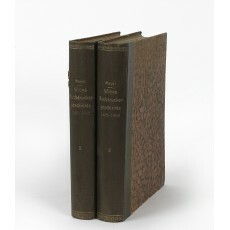 Two volumes (31 cm), I (1482-1682): xvi, 404 pp., colour frontispiece, numerous plates in colour, and text illustrations. II (1682-1882; Nachtrag): viii, 423 pp., numerous plates (some in colour), and text illustrations. Contemporary linen-backed boards. - Still the authoritative work on Viennese printing. Descriptive notices of the presses active from 1482 to 1682 are followed by lists of their productions, enumerating in all 2232 titles, excluding works which had been listed by Michael Denis (Wiens Buchdruckergeschichte bis MDLX, 1782-1793), and works of minor importance published after 1640; 401 are titles of works issued 1482-1560, not recorded by Denis. ¶ Provenance: E.P. 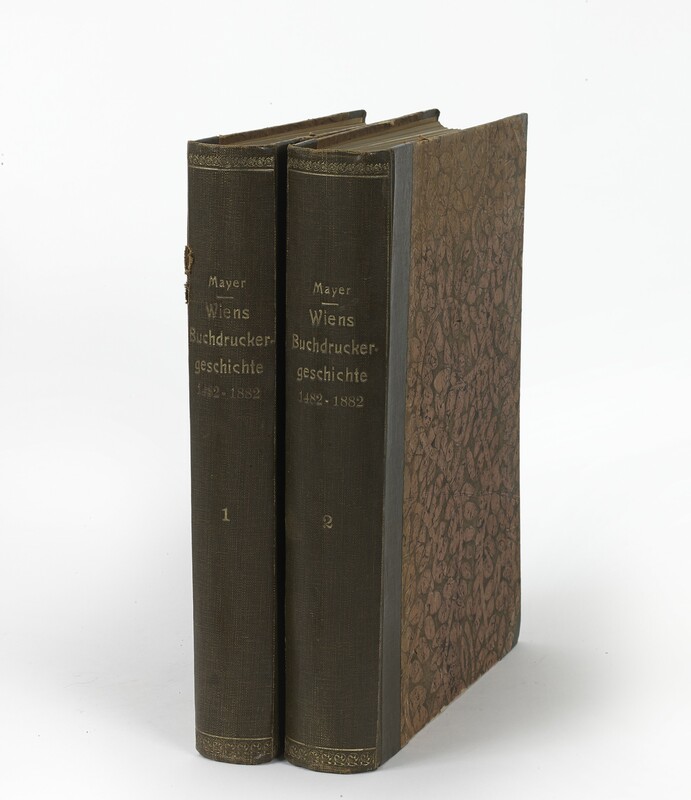 Goldschmidt & Co. Ltd, London (Catalogue 95, 1951, item 261); L’Art Ancien, Zurich (occasional pencil inscription of Erwin Rosenthal), from the auction sale of L’Art Ancien’s Handbibliothek, conducted by F. Zisska & R. Kistner, Munich, 27-28 March 1984, lot 1514. Spine of volume I abraded; otherwise an excellent, unmarked copy.